Single-stranded (ss) DNA viruses in the family Geminiviridae are proving to be very useful in real-time evolution studies. The high mutation rate of geminiviruses and other ssDNA viruses is somewhat mysterious in that their DNA genomes are replicated in host nuclei by high fidelity host polymerases. Although strand specific mutation biases observed in virus species from the geminivirus genus Mastrevirus indicate that the high mutation rates in viruses in this genus may be due to mutational processes that operate specifically on ssDNA, it is currently unknown whether viruses from other genera display similar strand specific mutation biases. Also, geminivirus genomes frequently recombine with one another and an alternative cause of their high mutation rates could be that the recombination process is either directly mutagenic or produces a selective environment in which the survival of mutants is favoured. To investigate whether there is an association between recombination and increased basal mutation rates or increased degrees of selection favoring the survival of mutations, we compared the mutation dynamics of the MSV-MatA and MSV-VW field isolates of Maize streak virus (MSV; Mastrevirus), with both a laboratory constructed MSV recombinant, and MSV recombinants closely resembling MSV-MatA. To determine whether strand specific mutation biases are a general characteristic of geminivirus evolution we compared mutation spectra arising during these MSV experiments with those arising during similar experiments involving the geminivirus Tomato yellow leaf curl virus (Begomovirus genus). Although both the genomic distribution of mutations and the occurrence of various convergent mutations at specific genomic sites indicated that either mutation hotspots or selection for adaptive mutations might elevate observed mutation rates in MSV, we found no association between recombination and mutation rates. Importantly, when comparing the mutation spectra of MSV and TYLCV we observed similar strand specific mutation biases arising predominantly from imbalances in the complementary mutations G → T: C → A. While our results suggest that recombination does not strongly influence mutation rates in MSV, they indicate that high geminivirus mutation rates are at least partially attributable to increased susceptibility of all geminivirus genomes to oxidative damage while in a single stranded state. Rapidly evolving viruses can offer unique insights into the relationships between nucleotide substitution dynamics and, for example, the evolution of multi-drug resistance [1, 2], immune evasion , vaccine escape , host range variation [5, 6] and host resistance-breaking [7–10]. Much of the adaptive potential of viruses stems from their large population sizes and, in many instances, their high degrees of genetic variability. In the case of RNA viruses the use of error-prone RNA polymerases during replication is the primary driver of high basal mutation rates  – defined here as the basal rate at which mutations arise. Many RNA viruses also have high substitution rates – defined here as the rate at which mutations become established within populations – which reflects the probability of arising mutations becoming fixed within virus populations, and is subject to the effects of processes such as natural selection [12, 13], competition with other mutations , and overall viral population dynamics [15, 16]. However, among DNA-containing viruses, which typically have much lower mutation rates than RNA viruses, the substitution rates of many single-stranded (ss) DNA viruses have been estimated to be the in order of 10-3 to 10-5 substitution per site per year [5, 17–19]: substitution rates approaching those typical of RNA viruses [20, 21]. Since ssDNA viruses replicate using their hosts’ high fidelity DNA polymerases , additional mutagenic factors have been sought to explain their paradoxically high mutation rates. Such factors might include chemical or enzyme-induced methylation and deamination of nucleotide bases [23, 24], genomic secondary structure-induced replication errors , or the mode of virus replication (with the stamping machinery mode of replication expected to result in lower mutation rates than geometric replication [26, 27]). The ssDNA viruses of the family Geminiviridae display substantial mutation biases that could potentially indicate the cause(s) of their high mutation rates. In both field isolated geminiviruses in the genus Begomovirus and mutants arising during evolution experiments involving geminiviruses in the genus Mastrevirus[18, 29], particular oxidative-damage related mutations such as G → T, C → T and G → A apparently occur more frequently than other mutations. In the mastreviruses one of these mutations, G → T, occurs in a markedly strand-specific manner . It is however, currently unknown whether or not such strand-specific mutation biases are a general feature of geminivirus evolution. Another factor potentially influencing both the substitution and mutation rates of geminiviruses is genetic recombination, which in some instances has been shown to be mutagenic [30–32]. The possible interplay between mutation, substitution and recombination rates is particularly interesting when considering the geminiviruses. Both rampant recombination and high nucleotide substitution rates  are credited with the emergence of many of the geminivirus species that today threaten the production of various important food crops [34, 35]. Among the most important of these species is Maize streak virus (MSV), variants of which seriously constrain maize production throughout sub-Saharan Africa . MSV has a single component, circular, ~2.7 Kb ssDNA genome that encodes only four proteins: Replication-associated proteins Rep and RepA in the complementary-sense [37–41], and a movement protein (MP) and coat protein (CP) in the virion-sense [37, 42–44]. A long intergenic region (LIR) [45, 46] separates the start codons of the complementary and virion-sense genes, which in turn converge on a short intergenic region (SIR). To determine first, whether an association exists between mutation and recombination events in MSV and second, whether strand specific mutation biases are a general feature of geminivirus evolution, we analysed in controlled laboratory infections, the mutation dynamics of field isolated MSV genomes relative to those of (1) a laboratory constructed MSV recombinant, (2) MSV recombinants that emerged during a previously reported MSV evolution experiment , and (3) Tomato yellow leaf curl virus (TYLCV) mutants that emerged during another previously reported evolution experiment . Specifically, we intended to answer the following questions: (1) Is the process of MSV recombination mechanistically mutagenic, (2) is there an adaptive period following recombination during which nucleotide substitution rates are elevated and, (3) are the mutation spectra arising during controlled MSV and TYLCV evolution experiments indicative of conserved strand-specific mutation biases. Agroinfectious clones of the wild-type (wt) MSV isolates, MSV-VW  and MSV-MatA , have been described previously. However, MSV-VW and MSV-MatA-derived mutant genomes arising during evolution experiments are introduced here for the first time (see Additional files 1 and 2). Similarly, mutants of the laboratory constructed recombinant genome, VWMPCPLIRMat  are also mentioned here for the first time, whereas mutated, mostly MSV-MatA-like, recombinant genomes (see Additional files 3, 4 and 5), have been reported previously  and are re-analysed here. TYLCV derived mutant genomes arising during evolution experiments conducted by Martin et al. are described here for the first time. We agroinoculated five three-day-old seedlings of the MSV-sensitive maize genotype Sweetcorn cv. Golden Bantam (GB; Millington Seed Co. USA) with MSV-MatA or MSV-VW (five plants per virus) as described previously . At 101 days post inoculation (dpi) we isolated viral DNA from a single symptomatic leaf of each of the ten infected plants. Similarly, we inoculated 18 GB seedlings using the VWMPCPLIRMat chimaera and isolated viral DNA from each plant between 55 and 68 (average of 61 days) dpi. Viral DNA was isolated using the Extract-n-Amp™ kit (Sigma-Aldrich), followed by rolling-circle amplification as previously described [53, 54]. Amplified DNA was digested with the restriction enzyme BamHI to generate ~ 2.7 kb monomeric MSV genomes which were gel-purified (GFX™, GE Healthcare), ligated to BamHI-digested pGEM®-3Zf(+) (Promega Biotech) using T4 DNA ligase (Fermentas), and used to transform competent Escherichia coli (E. cloni®, Lucigen® Corporation) using standard protocols . From each plant we randomly selected between one and six cloned genomes for sequencing (Macrogen, Korea) using universal M13 forward and reverse sequencing primers and previously-described MSV-specific primers . Within all of the different viral genomes used to initiate the various evolution experiments we calculated the expected frequencies of each of the twelve possible nucleotide mutations (i.e. all of the possible transitions and transversions), as outlined previously . Similarly, deviation of observed mutation frequencies from their expected frequencies was detected using a two-tailed chi-square test as in van der Walt et al. which explicitly accounts for differences in parental virus nucleotide compositions. The observed and expected number of transition (Ts) and transversion (Tv) mutations were calculated by summing up the frequencies of all observed and expected Ts and Tv mutations, respectively. The observed Ts and Tv mutation frequencies were collectively tested for significant deviation from random expectations using the same chi-square test. We expressed the mutation rate of each of the different viruses used to initiate the various evolution experiments as the number of mutations occurring per nucleotide, per year (muts/site/year). For each individual plant, we first divided the number of mutations observed in the viral progeny by the number of nucleotides sequenced (that is, from between one and six viral genomes), then divided this number by the time in years between inoculation and when the genomes were sampled to obtain the mutation rate per plant. We then calculated the mutation rates of each of the viruses used to initiate the evolution experiments as the average mutation rate across all of the plants inoculated with these viruses. To calculate the significance of mutations in our evolutionary experiments occurring in sites deemed to be evolving under negative or non-negative (i.e. both positive and neutral) selection pressure in the MSV-A genome, we used the observed frequency of mutations under the categorical variables, type of selection and type of mutation, to calculate a two-tail p-value (Fisher’s Exact Test) using a 2X2 contingency table. Whereas we hypothesised that genes evolving under positive selection might accumulate more non-synonymous mutations than expected, we hypothesised that those evolving under negative selection might accumulate fewer non-synonymous mutations than expected. We used a two-tailed Fisher’s exact test to determine whether mutations occurred more or less frequently in coding regions than in non-coding regions, by comparing the numbers of mutations observed over these respective regions in VWMPCPLIRMat-derived genomes and recombinant MSV genomes (2,219 nts, and 470 nt in each region, respectively), MSV-VW-derived genomes (2211 nt and 471 nt, respectively), and MSV-MatA-derived genomes (2226 nt and 463 nt, respectively). To further infer the types of selection pressure acting on individual genes of VWMPCPLIRMat, MSV-VW and MSV-MatA, we used the random effects likelihood (REL), fixed effects likelihood (FEL), internal fixed effects likelihood (IFEL), and single-likelihood ancestor counting (SLAC) methods implemented in the web-server Datamonkey (http:http://www.datamonkey.org) [57, 58]. For this analysis, we used the F81  nucleotide substitution model determined to be the best fit model for each dataset analysed (see Additional file 6). We also conducted almost identical analyses on the coding regions of publically available MSV-A full genome sequences (358 in March 2011). The only difference in the analyses of the publically available sequences was the use of the generalized time reversible (GTR) nucleotide substitution model which was determined to be the best fit model using the computer program RDP3  and the inference of codon specific synonymous:nonsynonymous substitution ratios. In order to determine first, whether in MSV genomes the recombination process is itself mutagenic (and therefore causes an increase in the basal mutation rate) and second, whether recombination generates a selective environment where there is an increased frequency of adaptive mutation (and therefore an increased substitution rate) [61, 62], we infected maize plants with the wild-type (wt) viruses MSV-MatA (a maize-adapted virus) and MSV-VW (a grass-adapted virus), and a laboratory-constructed chimaera of these, VWMPCPLIRMat. We allowed these viruses to evolve within the infected plants for between approximately 60 and 101 days and then conducted an analysis on the mutations generated within that time. Similarly, we analysed the mutation dynamics of the recombinant MSV genomes (some of which had evidence of up to 22 recombination breakpoints) isolated from infected maize plants by Monjane et al. . Collectively, we sequenced and analysed 27 MSV-MatA derived, 16 MSV-VW derived and 18 VWMPCPLIRMat derived genomes. We additionally analysed 49 recombinant MSV genomes previously isolated from MSV-sensitive plants , and 142 TYLCV derived genomes described by Martin et al..
To visualize the distribution of unique mutations (i.e. mutations were counted only once irrespective of how many plants they were observed in), we mapped the sites at which they occurred (Figure 1). Of the 104 unique mutations identified among all the analysed genomes (i.e. 14, 23, 24, and 36 unique mutations identified in plants inoculated with, respectively, VWMPCPLIRMat, MSV-MatA, MSV-VW, and recombinant MSV genomes), seven mutations occurred independently in multiple different plants (see Additional file 7). Distribution of mutations in recombinant and wild-type MSV genomes. Under the name of each group of mutants (that is, VWMPCPLIRMat, MSV-MatA, MSV-VW, and the VWMPCPMat + MatMPCPVW and VWMPCPLIRMat + MatVMPCPLIRVW-derived recombinant MSV) the distribution of mutations is a composite of all the unique mutations identified in each population of viruses. Whereas the numbers that are written in italics and coloured in grey indicate sites where transversion mutations were detected, those in regular font and in black colour indicate sites where transition mutations were detected. These numbers are connected by vertical lines which refer to the mutated nucleotide of a specific virus listed in Additional file 7, and for simplicity we use the genomic co-ordinates of MSV-MatA to pinpoint the genomic position of each mutation. The lines are predominately drawn in black. However, those lines in red, blue or green indicate genomic positions (among at least a pair of viruses belonging to the different virus population groups) where identical mutations were detected. Those genomic sites where at least two viruses isolated from different plants have a particular convergent mutation are indicated using the symbols *, †, ‡ and §. At the bottom of the panels, MP (movement protein), CP (coat protein), SIR (short intergenic region), C2 + C1 (replication-associated proteins), and LIR (long intergenic region) delineate MSV open-reading frames and intergenic regions. In all the virus populations analyzed, mutations were observed in all the genomic regions (Figure 1). However, while there was no statistically significant difference between the numbers of mutations observed in the coding and non-coding regions of viruses derived using VWMPCPLIRMat, MSV-VW or the recombinant MSV genomes (p = 0.179, 0.082, 0.202, respectively; Fisher’s exact test), there were disproportionally more mutations within the non-coding regions of MSV-MatA mutants (p = 0.008; Fisher’s exact test). This concentration of mutations in the non-coding regions of maize-adapted MSV mirrors that seen in East African cassava mosaic Cameroon virus (EACMCV; a geminivirus in the genus Begomovirus) propagated in cassava . Relatively fewer mutations within the coding regions of MSV-MatA than in the other viruses studied may reflect the fact that MSV-MatA proteins are already highly maize adapted whereas those in MSV-VW, the VWMPCPLIRMat chimaera and the various recombinants are not as well adapted and have therefore experienced higher rates of nucleotide substitution due to the fixation of adaptive mutations over the course of our experiment. In addition to host adaptation in VWMPCPLIRMat and the recombinant viruses, it is possible that increased mutation rates in coding regions may also be associated with adaptation of genes derived from different parental viruses to one another. Although we generally assume here that the basal MSV mutation rate is constant across the genome, it should be pointed out that there are instances where virus mutation rates have been found to vary greatly from site to site within a genome . Here we use our mutation data to establish whether regions prone to mutation might exist within the MSV genome. Of the 104 unique mutations identified, 97 were only ever seen in viruses originating in individual plants. Seven, however, occurred at sites that may be hot-spots for mutations in MSV because: (1) among these, convergent mutations occurred at some sites in between two and six independently-infected plants (for example, the G(359)T mutation detected in a pair of recombinant viruses, the G(164)A mutation in both a MSV-MatA derived virus and a MSV-VW-derived virus, the T(2473)G mutation seen in nine MSV-MatA and one MSV-VW derived viruses (viruses isolated from five plants independently infected with MSV-MatA, and one plant infected with MSV-VW; All genome coordinates are relative to the MSV-MatA genome; see Additional file 7); (2) two individual sites experienced two or three divergent mutations (for example, the A(2475)G/T/C mutations in MSV-MatA, MSV-VW, recombinant MSV, and VWMPCPLIRMat derived viruses and the T(2476)C/G mutation in MSV-VW derived viruses); and (3) clusters of mutations were observed at adjacent sites, for example 22 independent mutation events were collectively detected across the various experiments at positions 2473, 2474, 2475 and 2476; see Additional file 7). Whereas three of the potential mutation hot-spots were found within the LIR (two unique convergent mutations were detected at two of these sites accounting for four of the five detected convergent mutations in the LIR), one each was found within the mp and cp genes. It is important to point out here that recurrent convergent mutations at individual genome sites have been reported previously in geminivirus evolution experiments. In the case of MSV, a nucleotide site within the portion of the rep gene encoding the retinoblastoma-related protein binding domain was observed to rapidly and repeatedly mutate from an atypical MSV-A polymorphism to one that is conserved in all known field isolated MSV genomes [64, 65]. Similarly, a readily mutable nucleotide site has been reported in plants independently-infected with the begomoviruses Tomato yellow leaf curl China virus (TYLCCV ), and Tomato golden mosaic virus (TGMV ). In all of these studies, recurrent convergent mutations were likely adaptive, in that they probably restored functional nucleic acid secondary structures and/or protein interaction motifs. Due to their compact, structurally simple, and yet functionally complex genomes, ssDNA viruses such as MSV would be expected to have a low degree of mutation robustness [14, 68], such that the vast majority of arising mutations would be expected to be at least slightly deleterious. One would therefore expect the basal mutation rate to be substantially higher than the substitution rate. With this in mind our observation of seven convergent mutations in different independent infections indicates that either the observed mutations are neutral (or perhaps only mildly deleterious) but occur at sites where the mutation rate is much higher than elsewhere in the genome, or that the mutation rate is uniformly high throughout the MSV genome and the mutations at these sites are selectively favoured because they are beneficial. We therefore investigated the potential biological implications of these convergent mutations. 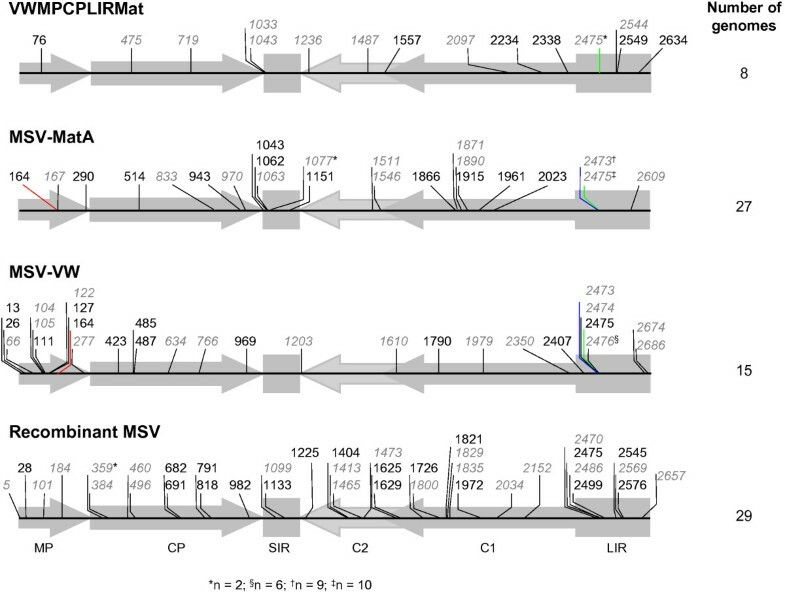 The G(359)T mutation observed in a pair of recombinant MSV viruses (see Additional file 7) occurred within the potential nuclear localization signal domain located within the cp of MSV , at a site where purine bases are conserved in all known MSV strains (data not shown). This mutation caused a non-synonymous amino acid change (see Additional file 7) from a serine residue with a short hydrophilic side-chain at position 15 of the CP to an isoleucine residue with a large hydrophobic side-chain: a change that would be expected to substantially alter the N-terminal structure of CP relative to that of all other known MSV isolates. It is therefore unlikely that this mutation was completely neutral. A G(164)A mutation in the mp of one MSV-MatA derived virus and one MSV-VW-derived virus occurred at a site encoding a residue within the hydrophobic potential trans-membrane domain of MP . Amongst almost all known field isolated MSV genomes (there is only one exceptional genome out of 581; data not shown), a guanine base is conserved at this site. This mutation would have resulted in a relatively conservative amino acid change from a hydrophobic valine residue to a hydrophobic isoleucine residue and it is therefore possible that the mutation was selectively neutral. Intriguingly all five of the convergent mutations in the LIR and two additional unique mutations, were associated with the TATA box positioned 101 nt upstream of the rep start codon. Whereas the convergent T(2473)G mutations were observed in MSV-MatA and MSV-VW derived genomes, the convergent A(2475)G mutations were observed in recombinant MSV, MSV-MatA, MSV-VW, and VWMPCPLIRMat derived genomes, the A(2475)T mutation was observed in MSV-MatA and VWMPCPLIRMat derived genomes, and both the T(2476)C/G mutations were observed only in MSV-VW derived genomes (see Additional file 7 and Figure 1). It is perhaps because base changes within the TATA boxes of promoter elements will adversely affect transcription [71, 72] that only a very small number of wt MSV isolates (data not shown) have polymorphisms within the above-mentioned TATA box. The high degree of sequence conservation observed between nucleotide positions 2473 and 2475 in wt MSV isolates strongly suggests that the mutations observed at these sites in our experiment are probably deleterious. In fact, the deleterious effects of a point mutation within this TATA box has already been experimentally verified in the wt MSV-A isolates, MSV-Ns (GenBank accession number: X01633) and MSV-Nm. Although these isolates differ by only three nucleotides, the former induces considerably more severe symptoms in maize plants . However, a A(2473)G mutation in MSV-Ns (a site that is homologous to that at which we detect the A(2475)G/T/C mutations) and the converse G(2473)A mutation in MSV-Nm had a substantial influence on symptom severity in maize . The fact that the G to A mutation in the MSV TATA box enhanced the virulence of MSV-Nm, and the reverse mutation (i.e. A to G) significantly decreased the virulence of hybrids of these genomes , supports the hypothesis that the A(2475)G/T/C and other TATA box mutations we observe are likely to be at least mildly deleterious. One cannot exclude the possibility, however, that virulence does not reflect virus fitness in this case. For example, mutations that reduce the virulence of MSV variants might, within the context of a mixed infection with wild-type highly virulent variants (i.e. situations where some degree of genetic complementation is likely), increase the replicative capacity of these mutants relative to their more virulent progenitors. Of the seven convergent mutations that we observed it seems unlikely that either the cp mutation or the TATA box mutations are neutral. If these non-neutral mutations are deleterious, it would indicate that these particular genome sites must have extremely high mutation rates (especially those in the TATA box) to account for the fact that they have been observed despite selection acting to remove them. It is perhaps therefore more plausible that these mutations are at least slightly adaptive within the context of the specific infections where they arise, and that their observation in multiple plants reflects the fact that whenever these mutations arise within an MSV infection of the maize genotype GB, they are selectively favoured to the point where they attain frequencies high enough to be detectable. The absence of analogous mutations in field isolated MSVs may reflect the fact that these mutations are possibly only adaptive within the specific infections where they arise because these infections also contain wild-type genomes capable of complementing the mutants. Following transmission the mutant viruses might not be able to survive in the long-term due to the fact that they will eventually become separated from co-infecting viruses that do not carry the mutations. Of the various virus genotypes analysed here, MSV-MatA is the most maize-adapted followed by the recombinant MSV genomes, VWMPCPLIRMat and MSV-VW . Given their particularly reduced fitness in maize we expected that during the course of our evolution experiments VWMPCPLIRMat and MSV-VW-derived viruses might display evidence of increased rates of adaptive evolution. Whereas in the case of MSV-VW and the MSV-VW derived portions of VWMPCPLIRMat (i.e. the SIR, rep and ~ 85 nts of the LIR) these adaptive mutations could have been those that optimised virus-host molecular interactions [46, 51], in the case of VWMPCPLIRMat these could additionally have included mutations that re-established vital sequence specific interactions between the MSV-MatA and MSV-VW derived portions of its genome [51, 74]. Specifically, we expected that the accumulation of adaptive mutations in VWMPCPLIRMat and MSV-VW derived viruses might be evident from the spectra of the mutations identified within these viruses. Firstly though, to infer the specific types of selection pressures acting on field isolated variants of the maize-adapted MSV-A strain, we calculated the ratio of the rates of non-synonymous (d N ) and synonymous (d S ) mutations (i.e. the dN/dS ratio) arising within coding regions using the codon-based maximum likelihood-based selection detection methods REL, IFEL, FEL, and SLAC implemented in the web-server Datamonkey [57, 58]. We identified every codon within the MSV-A genome with some evidence (an associated p-value <0.05) of evolution under either positive or negative selection pressures (see Additional file 8). We then assessed whether the unique mutations identified in the coding regions of our various evolution experiments occurred in the codons inferred to be evolving non-neutrally within the genomes of field isolated MSV-A isolates. Using a Fisher’s exact test, we were unable to find any significant associations in any of the experiments between the locations of observed synonymous and non-synonymous mutations and sites within the MSV-A genome respectively evolving in nature under either negative or positive selection. We were also unable to detect any such associations when we combined the data sets (see Additional file 9), suggesting that the 78/104 mutations that were observed to occur within coding regions during our evolution experiments are not obviously subject to strong selection pressures in the field. In three of the four experimental mutant data sets (specifically excluding the recombinant virus data set because recombination invalidates dN/dS based selection analyses in this data set) the mean dN/dS values of almost all of the protein coding genes were < 1, suggesting pervasive negative selection (i.e. selection against non-synonymous base changes; see Additional file 6). Exceptionally, however, in the MSV-VW experiment the cp was inferred to be evolving under weak positive selection (mean dN/dS = 1.92 and 1.90 using the SLAC and REL methods, respectively), and, while the MSV-VW mp was on average inferred to be evolving under weak negative selection (mean dN/dS = 0.64 and 0.68 using the SLAC and REL methods, respectively), it contained two codons (p-value < 0.05) encoding amino acids within the MP hydrophobic domain (a probable trans-membrane domain ) that were inferred to be evolving under positive selection using the REL method (see Additional file 6). Although one should be cautious when it comes to interpreting these observations - due to the low numbers of mutations observed in the experimental viruses relative to those enumerated during the analyses of the field isolates - it is nonetheless interesting that the codons in the mp inferred to be evolving under positive selection in the MSV-VW-derived viruses are apparently evolving under predominantly neutral selection in the field isolated MSV-A sequences (see Additional files 6 and 8). Also, because MSV-VW is the least maize-adapted virus we analysed, it is the virus that we most expected to display some evidence of evolution under positive selection in maize. The fact that the weak signals of positive selection detected within MSV-VW are specific to the mp cp gene module is also potentially significant. This genome region is both the main pathogenicity determinant in maize of the maize adapted MSV-A strain  and its transfer by recombination from a Digitaria adapted MSV-B-like virus to a Digitaria adapted MSV-G or –F-like virus is credited with the genesis of the progenitor of all MSV-A isolates . Besides the probability that recombinant viruses might experience elevated degrees of positive selection favouring the restoration of recombinationally disrupted intra-genome interactions (a process that might be associated with increased numbers of detected mutation events), it is also plausible that the recombination process itself might be inherently mutagenic [31, 32]. We therefore compared the mutation rates of the laboratory constructed recombinant, VWMPCPLIRMat, and recombinant MSV genomes , with those of the wt MSV-MatA and MSV-VW genomes. Within the recombinant MSV genomes we deduced mutation rates of 1.77 × 10-3 muts/site/year based on a total of 39 mutations detected in 131,761 sequenced nts from 49 recombinant genomes (see Additional file 10). For VWMPCPLIRMat a mutation rate of 1.99 × 10-3 muts/site/year was calculated based on 16 mutations detected in 48,402 sequenced nts from 18 genomes. Both of these rates were slightly lower (albeit not significantly so) than those determined for MSV-MatA (2.02 × 10-3 muts/site/year determined from 41 mutations detected in 72,603 sequenced nt from 27 genomes; see Additional file 10) and MSV-VW (2.41 × 10-3 muts/site/year determined from 33 mutations detected in 42,912 sequenced nt from 16 genomes; see Additional file 10). The fact that the estimated mutation rate of the MSV-A-like recombinants arising during recombination experiments was lower than that of all the other examined groups of genomes strongly suggests that the mechanistic process of recombination in MSV is probably not mutagenic. Similarly, the fact that the laboratory constructed recombinant genome, VWMPCPLIRMat accumulated mutations at a lower rate than both the MSV-MatA and MSV-VW genomes indicated that it was probably not subject to higher degrees of positive selection acting on arising mutants than non-recombinant genomes. It is important to note, however, that our wild-type and recombinant genomes were not all sampled at exactly the same times post infection. The wild-type genomes were, in fact sampled on average 41 days later than the recombinants and were, relative to the recombinants, subject to selective pressures for longer periods. The overall effect of this increased selection should have been to reduce, at least slightly, the mutation rates observed in the wild-type genomes relative to those in the recombinant genomes . Nevertheless, the fact that the mutation rates observed in the wild type genomes were actually higher than those observed in the recombinant genomes therefore even more strongly supports the assertion that recombination is not associated with elevated mutation rates. Considering the lack of any evidence of elevated substitution rates that may have been driven by higher degrees of selection acting on the recombinant genomes, it is important to note that we nevertheless detected one very clear signal of selection within the distribution of mutations that we identified. Specifically, the non-coding regions of viruses in all of the MSV experiments accumulated mutations at over twice the frequency of the coding regions: 4.34 × 10-4 mut/site versus 2.67 × 10-4 mut/site for the recombinant MSV genomes, 5.91 × 10-4 mut/site/year versus 2.75 × 10-4 mut/site for VWMPCPLIRMat, 14.8 × 10-4 mut/site versus 3.7 × 10-4 for MSV-MatA, and 11.3 × 10-4 mut/site versus 5.6 × 10-4 mut/site for MSV-VW (see Additional file 10). Among geminiviruses such a trend is apparently not unique to MSV [17, 62, 66, 76, 77], and this is likely attributable to generally reduced negative selection pressures acting on geminivirus non-coding regions . It should also be stressed here that it is very likely that the mutation spectra observed in our short-term evolution experiments were considerably less influenced by selection than those encountered in either longer-term evolution experiments, or viruses sampled from nature. The MSV genome-wide mutation rates determined in our short-term evolution experiments (i.e. experiments lasting less than four months) are 8–12 times higher than those determined in longer term experiments spanning one to 32 years (~0.2 × 10-3 – 1.05 × 10-3 subs/site/year,[18, 29, 78], but are very close to mutation rates determined in evolution experiments carried out over a similar time-frame for the geminiviruses TYLCCV (between 2.49 and 1.61 × 10-3 subs/site/year ; and TYLCV (1.4 × 10-3 subs/site/year ). These differences in mutation rates between short- and long-term evolution experiments are entirely consistent with the hypothesis that in short-term experiments negative selection has less of a modulating influence on mutation frequencies than in longer term experiments. Therefore, the mutation rates calculated in our short-term evolution experiments may reflect a closer approximation to the basal MSV mutation rate than previously determined from longer-term experiments which are likely to have been more strongly influenced by selection and genetic drift [68, 80–82]. It is noteworthy that these short-term mutation rates approximate the substitution rates typical of fast-evolving RNA viruses [20, 21]. To explain the high mutation rates of geminiviruses, it is thought likely that replicating geminivirus DNA remains un-methylated  and as a consequence of this it is unaffected by the corrective mismatch repair systems of the host cells upon which they rely for replication . Similarly, the base-excision repair mechanisms of host cells may also be ineffectual because geminivirus DNA is only transiently double-stranded during rolling-circle replication . Furthermore, because geminiviruses spend a significant amount of time in a single-stranded state, high mutation rates may also be explained by spontaneous or enzyme-induced deamination of unpaired DNA bases [85–88]. In MSV, the effects of a predominantly single-stranded existence is perhaps manifest in strand specific nucleotide mutation biases that are indicative of spontaneous mutations occurring predominantly on the virion-strand [18, 29]. To further explore the possibility that virion-strand specific mutation biases are a feature of geminivirus evolution in general, we determined with greater precision than has been previously achieved with much smaller data sets the nucleotide mutation spectra of MSV (a mastrevrius), and TYLCV (a begomovirus). Our TYLCV data set was derived from a set of sequences obtained during evolution experiments described by Martin et al. that were carried out over a comparable time-frame (120 days) to those described here. It was unfortunately not possible to pool our data with nucleotide mutation frequency data obtained in various other published evolution experiments, where either input virus sequences were unknown and mutation counts were inferred by maximum likelihood or parsimony based approaches [17, 18, 28], or where observed mutations were derived only from small portions of the virus genome . Using the number of mutations observed in our MSV and TYLCV data sets, we assumed that a bias towards mutations occurring on the virion-strand would be evident in the disproportionate numbers of complementary mutations: for example, A → G mutations are complementary with T → C mutations and are expected to occur at almost exactly the same frequency if there are no strand-specific mutation biases. Assuming that complementary mutations are approximately equally probable (our null hypothesis) we calculated the binomial and two-tailed binomial probabilities associated with the A → G mutation rate equalling the T → C mutation rate, the A → C mutation rate equalling the T → G mutation rate, the G → A mutation rate equalling the C → T mutation rate, and the G → T mutation rate equalling the C → A mutation rate. The reversible mutations, A → T and T → A, C → G and G → C were excluded because these can yield no information on potential strand-specific mutation biases. For the recombinant MSV data we detected the same imbalance between G → T : C → A mutations (8:2 mutations; p = 0.132) as has been detected previously in long-term evolution experiments involving MSV [18, 29], and the mastrevirus Sugarcane streak Reunion virus (SSRV ; Table 1). Importantly, when the mutations from the recombinant MSV data, VWMPCPLIRMat and wt isolates (MSV-MatA and MSV-VW) were combined with those obtained previously in evolution experiments involving the field isolates MSV-Tas, MSV-Set and MSV-Kom and MSV-Kom/Set chimaeric viruses , further imbalances in G → T : C → A (29:9 mutations; p = 0.004), G → A : C → T (18:30 mutations; p = 0.052), and A → G : T → C (16:6 mutations; p = 0.054) were detected. In the TYLCV data set, however, we detected imbalances only between G → T : C → A (46:30 mutations; p = 0.051) and A → G : T → C (8:22 mutations; p = 0.02) mutations (Table 1). These results suggest that strand-specific mutation biases that are indicated by excessive G → T mutations occurring on the virion-strand (p-value < 0.051 in the case of both MSV and TYLCV) are probably conserved throughout the geminiviruses, and other biased mutations such as excessive G → A, A → G and C → T mutations may be particular to certain species or genera. aRecombinant genomes obtained using the MatMPCPVW + VWMPCPMat and MatMPCPLIRVW + VWMPCPLIRMat parental chimaeric MSV genomes . bData combined using values from this study only. cData combined using values from this study and from van der Walt et al..
dData obtained from Martin et al. *The calculated step-down multiple tested corrected p-values greater than 1 are simply represented as having a p-value of 1. While significant differences in the frequencies of complementary mutations are indicative of general strand-specific mutation biases, we noted, as have others, that particular mutations were likely over-represented amongst the spectra of mutations that we observed in our various evolution experiments. For example, while there was no statistical support for the number of transition (Ts) or transversion (Tv) mutations being either over- or under-represented than would be expected in most of our experiments, there was evidence of an over-representation of Ts mutations (p = 0.046) among the recombinant MSV genomes obtained using the MatMPCPLIRVW + VWMPCPLIRMat parental viruses (see Additional file 10). Moreover, when the data from the individual experiments were combined we detected an over-representation of Ts mutations (p = 0.011; see Additional file 10). Similarly, an over-representation of Ts mutations (p = 0.0002), coupled with a statistically supported under-representation of Tv mutations (p = 0.01; see Additional file 10), was detected in the TYLCV data set of Martin et al. . In good agreement with other studies on mutation biases in mastreviruses [18, 29], with the exception of the VWMPCPLIRMat data set (p = 0.12), we observed significantly higher than expected rates of C → T mutations in all of our other MSV data sets (p–values consistently lower than 0.012) and in the TYLCV data set (p < 1.0 × 10-8; see Additional file 10). Among the recombinant MSV genomes obtained using the MatMPCPVW + VWMPCPMat parental viruses, and in the TYLCV data set, we also observed a significantly higher than expected rate of G → T mutations (p = 0.002 and p = 5.2 × 10-7, respectively). However, contrary to previous studies on the mutation dynamics of MSV, where more frequent than expected G → A mutations, as well as lower than expected C → A, T → A and T → G mutations  were detected, neither in our individual data sets nor combined data set (see Additional file 10 and Additional file 11) were the increased or decreased frequencies of these mutations statistically supported (see Additional file 10 and Additional file 11). However, once the data were combined there was an overall lower than expected G → C mutation frequency (p = 0.040; see Additional file 10). Likely due to the large numbers of mutations considered in the TYLCV data set, and the fact that Ts mutations were observed to occur at a significantly higher rate than Tv mutations in this virus, six of the 12 possible nucleotide changes (five transitions and one transversion) were significantly less frequent than expected by chance, whereas four (two transitions and two transversions) were significantly more frequent (all p-values < 0.05; see Additional file 10). Crucially, in all cases where mutations were significantly over-represented in any one of the various MSV data sets (or under-represented when the data sets were combined) they were accordingly over- or under-represented in the TYLCV data set. As has been pointed out previously [28, 29], these mutations (specifically, the C → T, G → A and G → T mutations) are consistent with the notion that, relative to double-stranded DNA, ssDNA may experience elevated degrees of ssDNA targeted oxidative or enzyme-induced deamination reactions [85, 88, 89]. We have analysed the mutation dynamics of wt MSV isolates (MSV-MatA and MSV-VW), a laboratory-constructed chimaeric MSV and various recombinant viruses emerging during recombination experiments, and compared MSV mutation spectra with those occurring within the related begomovirus species, TYLCV. Whereas we find that neither recombination nor overall degrees of host adaptation in our short-term evolution experiments are associated with obvious overall variations in mutation frequencies, we cannot exclude the possibility that either recombination between different sets of parental geminivirus genomes, or selection of recombinants over multiple transmission cycles between a variety of different hosts in the field might have an influence on longer-term geminivirus substitution rates. Nevertheless even within our short-term experiments we find consistently elevated mutation rates within the non-coding genome regions. Our detection of pervasive negative selection within the coding regions of both our experimental recombinants and field isolated viruses is in keeping with the notion that these differences are due to negative selection acting less strongly on non-coding regions than it does on coding regions. Despite evidence of sporadic instances of possible positive selection (convergent mutations and high ratios of non-synonymous to synonymous mutations in certain codons), the fact that we detect vastly more evidence of negative selection than positive selection within the coding regions of MSV indicates that the very high MSV nucleotide mutation frequencies that we have reported here are probably still substantially lower than the virus’ basal mutation rate. Finally, we capitalise on the high numbers of mutations identified both in our MSV experiments and in a related study for the begomovirus, TYLCV , to firstly confirm that previously detected strand-specific nucleotide mutation biases in MSV are a general phenomenon during geminivirus evolution and, secondly, that there exist consistent trends within the mutation spectra of all geminiviruses that are likely indicative of common mutational stresses acting on their genomes whilst they are in a single stranded state. This project was funded by the National Research Foundation of South Africa. ALM was supported by the University of Cape Town, the Canon Collins Trust and the National Research Foundation (South Africa). AV was supported by the Carnegie Corporation of New York. PL and JML were supported by the Région Réunion, European Union (FEDER) and the Cirad. DPM was supported by the Wellcome Trust. ALM, DP, EvdW, DPM, EPR conceived the study and participated in its design. ALM, FL, DPM, PL isolated, cloned and sequenced the viral genomes and performed basic viral bioinformatics. ALM, DPM, FL, DP analyzed and interpreted the data. ALM, DPM, DNS, EvdW, AV, EPR, DP, FL drafted and revised the manuscript. All authors read and approved the final manuscript.